This is territory which has been covered before by other bloggers, but being the Down East Know-It-All, I want to set the record straight on a small point. As the regular reader knows, I am fascinated by design inspiration and sources, and strive for accuracy in noting those sources. As the palatial French Beaux Arts styles that had been the standard for grand houses in America fell out of fashion in the early 1900's, simpler French styles came into favor, based on smaller chateaux and manor houses, and La Lanterne was a popular source, with many adaptations built from coast to coast. Herewith a few of those copies, plus my point of disagreement with previous attributions. La Lanterne on steroids. 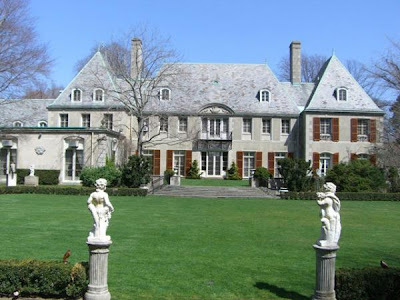 Horace Trumbauer's huge version, based on both the original and the Adler version, for banker James Clews, built on the eve of the Great Depression. Next up is the Brookville, Long Island estate of James Clews, head of the banking house of Henry Clews & Co., designed by Horace Trumbauer in 1929, called, originally enough, La Lanterne. Trumbauer may have given up the palatial beaux arts style of his earlier palaces, such as The Elms in Newport, but the scale of this house was, as typical of the architect, enormous, with huge rooms and over size doors and windows. The wings are two full stories, and larger than the original. Trumbauer copies the Oeil de Bouef windows from the Adler version, which he would have known from architectural publications. The Dilettante is convinced that Trumbauer's measuring tape showed a foot as 18 inches. After years as a convent, the center section of the house was torn down, and the wings became two large and separate country houses, the one on the left home of stylish Thelma Chrysler Foy's daughter Cynthia Rupp. In Newport, Rhode Island is Ker Arvor, built for Snowden Fahnestock in the early 1930's. Its stucco facade suffers much from heavy applications of white paint. Here we come to one of the Dilettante's Don'ts. Don't paint stucco. Let it age. Really. But, I digress. Also in Newport is the pretender that is my bone of contention. 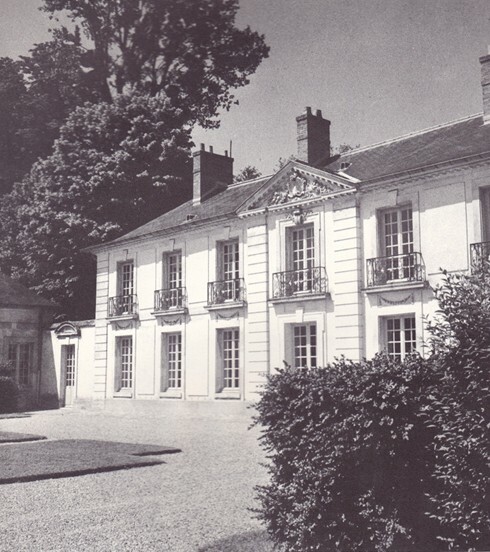 Champ Soleil, a lovely French manor house designed by Polhemus and Coffin for Mrs. Drexel Dahlgren, is often called, especially by realtors, a copy of La Lanterne. It is not. 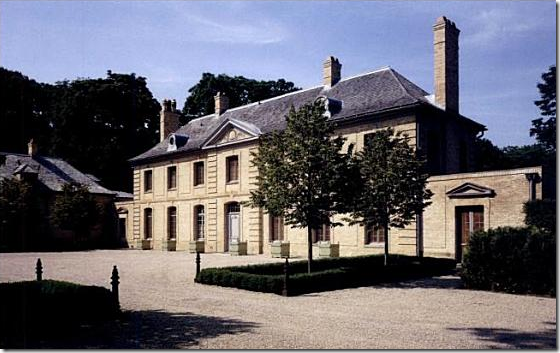 The entrance pavilion is based on that of La Lanterne, as are some window lintels, but there the resemblance stops. The house itself has steep roofs, and is composed in three parts. 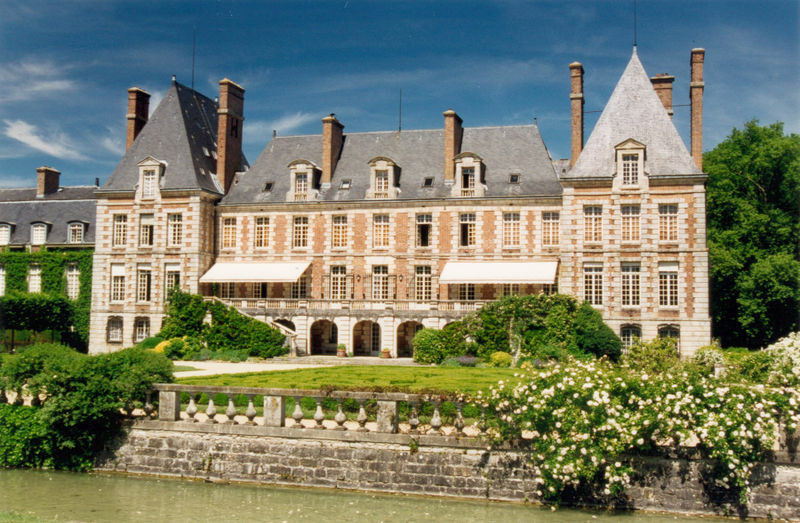 It is modeled on any number of French Manor houses and chateaux of similar composition, and its type was also a favorite from the Beaux Arts onward to the Champ Soleil. 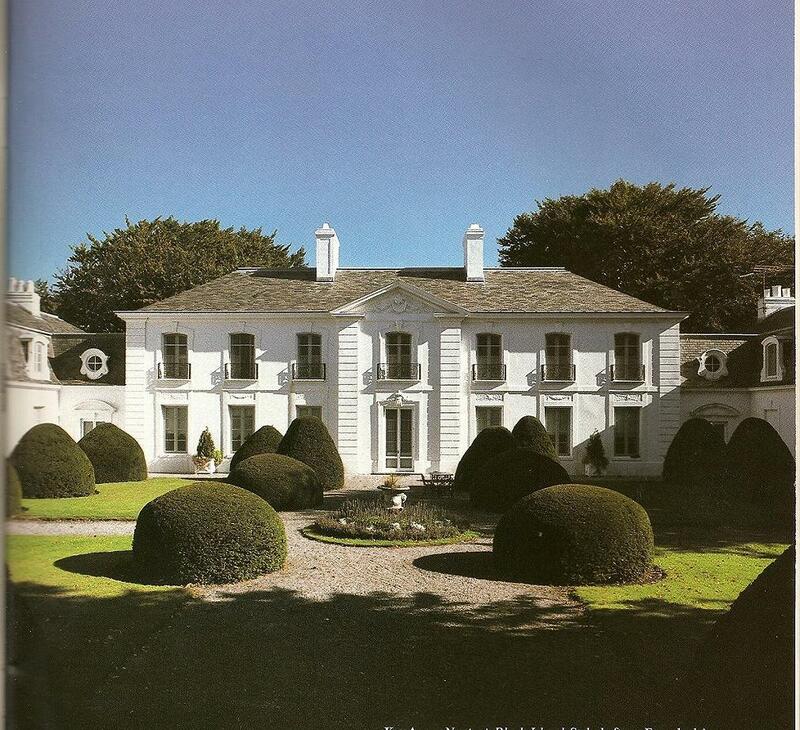 (Above) Champ Soleil, in Newport, designed for Drexel Dahlgren by Polhemus & Coffin in 1929. See the difference?. In 1947, Champ Soleil was purchased by Robert Goelet, who was seeking to downsize from Ochre Court, the 60 room French Medieval chateau in Newport that he'd inherited from his father years before. 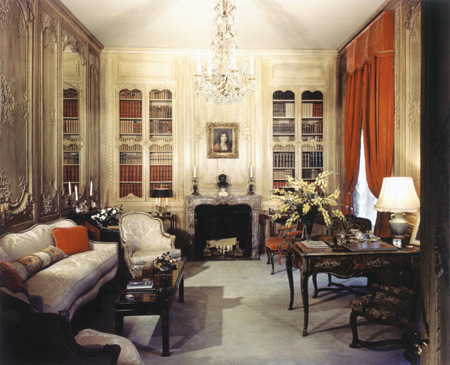 He immediately upsized Champs Soleil, adding a ballroom wing and hiring the uber fashionable firm of Jansen to do the interiors. 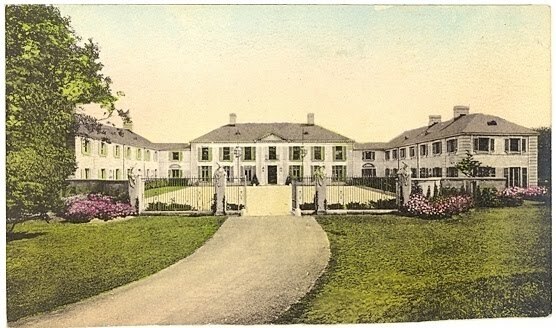 Years earlier, Goelet's first wife, Elsie Whelan, had left him for sculptor Henry Clews Jr., first cousin of James Clews, owner of the Brookville 'La Lanterne'. 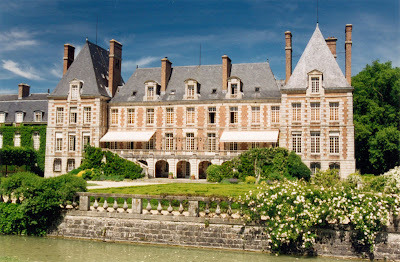 Elsie & Henry fled Newport for the French Rivera, where they renovated the Chateau de la Napoule, which gloomy pile was decidedly not inspired by La Lanterne, so we can stop here. We are clear, Dilettante, we are clear. Now I can go to my grave, erm, faculty meeting bright-eyed and bushy-tailed. Brilliant post and wonderful to read in those last few minutes as the clock ticks me nearer to 65 mile drive to work and I've yet to hit the shower. Thanks for that, we need such precision in writing about art history, there is far too much impressionistic waffle out there. You're knowledge of Newport makes me feel completely inept! Can you please come down here and give me a tour of my own state so I can impress friends and relatives next time they visit? Such an interesting post! It's a privilege to read your blog. How you mix that sharp sense of humor with your firm grasp of scholarship, I'll never know. But you do it, and thank you for sharing it with us as you do. 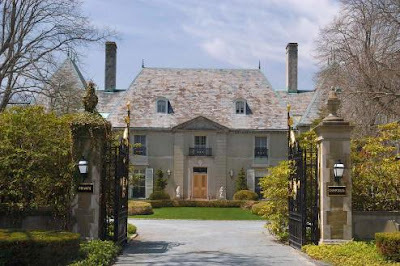 F.
Great blog - appreciate the comparisons of several of my favorite houses! Have always found Champ Soleil an interesting house but I am sketchy on the various owners after Mrs. Dahlgren. How long were the Goelets there? Was is also home to Aeriel Frazer Eweson? To a member of the Prince family? Member of Sonny von Bulow's family? Maybe a full post on the history of this house?? I'll take any amount of instruction from you, dear DED. Was never even aware of the glorious Lanterne in the first place so there you go. Another question (my specialty) - didn't you tell me before that Ker Arvor was by Charles Platt? I'm not certain of all the owners of Champs Soleil. By the seventies it was in the hands of Sunny Von Bulow's mother, Mrs. Aitken, whose widower's estate recently sold it. I didn't tell you that Ker Arvor was by Platt, and though I once knew who designed it---and it may well have been Platt---I don't know for sure. Adler's La Lanterne was originally lime washed white with gray trim and gray venetian blind awnings. The columns on the two rear temple style porches were faux marbe over limestone — a light and pretty, all paint, gray and white summer house. As much as it appears to be the most sensitive interpretations, in one way it what was the most irreverent of the copies. Originally it had two wings flanking the forecourt-as to be expected. 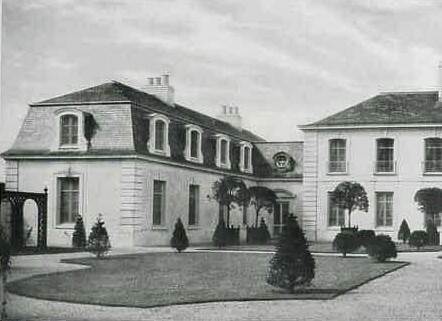 The South wing, a long service wing, was very reminiscent of the 18th century original but the North wing was only half as long as its partner. In addition this short wing had growing out of it center a rectangular two story tower with a high pitched roof as if dating for an earlier period. The tower contained a staircase to guest bedroom and the wing housed an empire style library plus a screened living porch behind the garden side temple facade. After the war the entire wing, tower temple and all, was rolled down to the end of the garden lawn, turned around with its temple porch positioned on axis to the house and it became a small "pavilion" for the then owners good friend. See - I had some bits and pieces but you had more info as I expected! We have to tap that trove of knowledge you have whenever an opportunity presents. Thanks! Also, I found a vintage real estate article that lists Russell & Clinton as the architects of Ker Arvor. 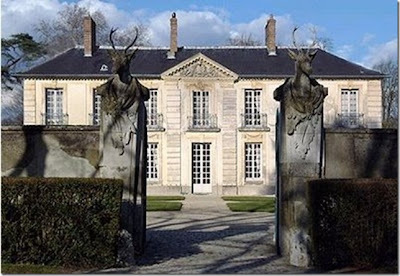 DED- one minor correction- the left wing of the Trumbauer/Clews Brookville La Lanterne was owned by Mrs. Byron Foy's daughter, Cynthia Foy Ruppp. 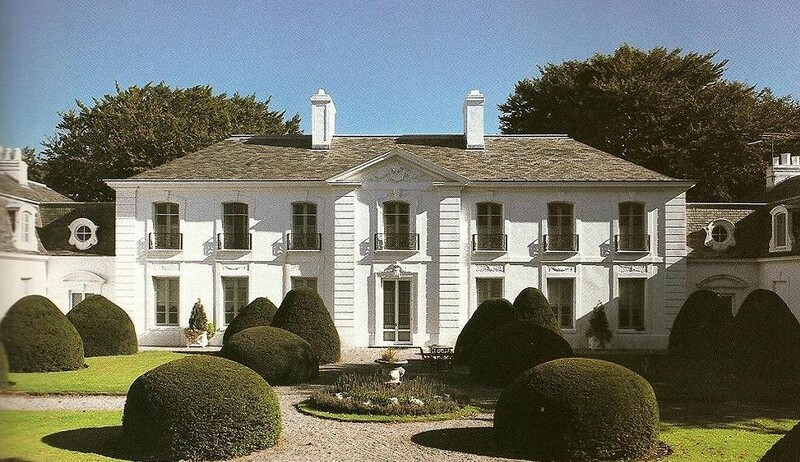 I'm sure that the ultra stylish and ultra imperious Thelma Foy would have found the wing far too small- and probably the original Trumbauer house as well. And how about the West Coast versions of La Lanterne for next semester's class? If I remember, there was an oil family named Keck who built one in the early 1980's and it goes on from there- a number of the versions make Trumbauer's effort look constipated, as you can well imagine. Oh how I missed your posts while away on vacation! This doesn't disappoint: You are so right to point out the error of the agents on champ soleil - it's so clearly NOT a lanterne copy. So often I find that real estate agents have no idea what they're talking about. One realtor friend told me he thought my apartment was 'victorian'? needless to say -i haven't spoken to him since. You'd think a realtor would be required to take a basic architectural history course; or at least do their research. They could start by reading your blog! 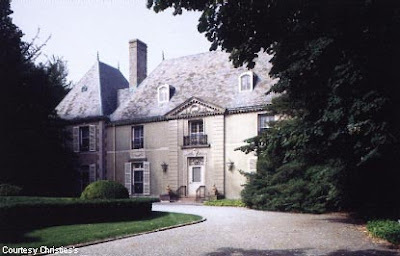 The Brookville house, if it had some demolition could also be the same beaux arts style house that Patrice Munsel, the opera singer lived in, off of Cedar Swamp road. It was a real beauty.